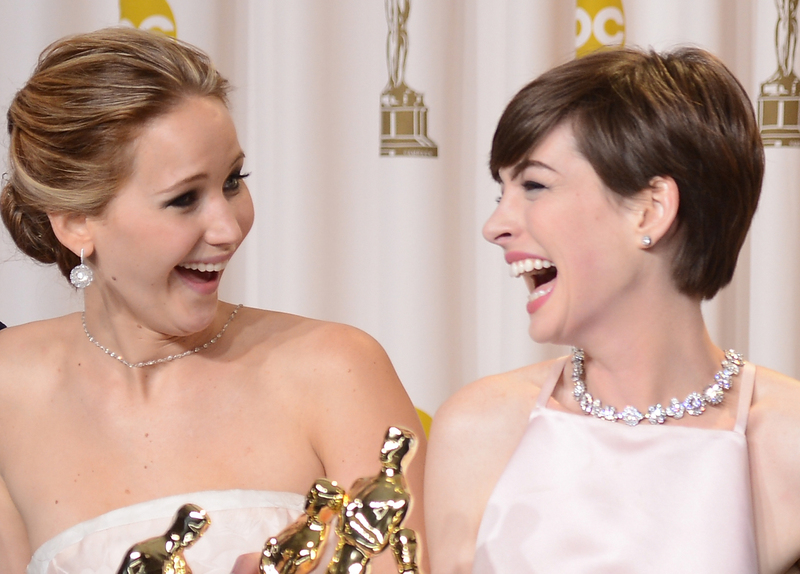 The 86th Academy Awards are officially in full swing. The 2014 Oscar nominations were announced in the early morning on Jan. 16 by Hollywood hunk Chris Hemsworth and Cheryl Boone Isaacs, president of the Academy of Motion Picture Arts and Sciences. We can't think of a better thing for an actor or actress to wake up to than a phone call saying they've been nominated for an Oscar, and for some lucky stars, that just became a reality. Naturally, nominees took to multiple outlets of media to express their happiness and gratitude for this prestigious honor. Oscar nominee for Best Supporting Actor in Captain Phillips, Barkhad Abdi, appeared on the Today Show immediately after the announcements finished to express his relief. "I'm feeling great. I'm really humbled and honored to be nominated for an Oscar. It's more than a dream coming true," Abdi told Savannah Guthrie. Guthrie asked him if he ever thought this would happen to him when he was working as a limo drive. "That's the story of my life. You have to live with it each day. I'm really excited about this. I couldn't even sleep all night thinking about it." Director of American Hustle, David O. Russell reacted to his Oscar nominations for Best Director and Best Screenplay by sharing his happiness for his actors and actresses. "I’m fighting a little cold here but this will certainly go a long way to boost my immune system.To have these actors really put their hearts in it all together, to have them each get a nod is a big deal for us because we created a family together." Jared Leto, who was nominated for Best Supporting Actor for his performance in Dallas Buyers Club, had food on the brain when he finally heard of his Oscar nomination. I thought I didn't get the nomination because I woke up and [mistakenly] thought it was getting light outside. But then I got a knock on the door from Emma Ludbrook, who produced Artifact with me. It feels absolutely amazing, and I'm incredibly honored to be part of this insanity. It's an absolute dream and I'm so proud to be part of a $4 million film about people fighting for their lives.Every scene, every day was incredibly challenging. I'm going back to bed and then wake up and make vegan pancakes. Steve Coogan, who was nominated for Two Oscars for his work on Philomena, is having all of the feelings about his Best Picture and Best Screenplay nods. Hollywood legend Judi Dench got her seventh Oscar nomination this morning for Best Actress in Philomena. Wolf of Wall Street's Best Supporting Actor nominee Jonah Hill is simply shocked. I am in complete and total shock. I honestly was not expecting this, on a level you can’t even imagine. Again, I’m clearly in shock. I didn’t have a plan for celebrating today because I truly did not expect any of this! But I am going to Critics’ Choice Awards and will be great to see everyone from the film there tonight. Truly, this is shocking. The Wolf of Wall Street's leading man and now Oscar nominee for Best Actor, Leonardo DiCaprio, shared his happiness with the entire Wolf team. I am deeply humbled by this honor and even happier to share today with Marty, Jonah, Terry as well as this entire cast and crew. The Wolf of Wall Street has been a passion project of mine, and I found the role to be one of the most challenging and rewarding of my career. Congratulations to all of my fellow nominees and thank you to the Academy for this extraordinary recognition. American Hustle's Best Actress nominee Amy Adams was barely awake when she heard the good news. It’s a very good thing to wake up to; we were all asleep! Am I still recovering from last weekend? Not really. I’m never really out late anymore at this stage in my life. Making Hustle was very challenging, so it’s really nice that people not only recognized the film but all the actors as well. And I’m so proud to have been in Her too, which has been recognized with a best picture nomination. As for celebrating today, maybe we should go out for a family hike? Then again, everyone looks pretty tired around here right now! Best Director nominee for 12 Years a Slave, Steve McQueen, is most happy for the achievements of the film's cast and crew as a family unit. I'm extraordinarily happy for all the cast and crew of our 12 Years a Slave family. This has been an amazing ride, and to receive nine nominations from the Academy is testament to all of the hard work. And for that I am truly grateful. The Academy Awards, which will be hosted by talk show host and comedian Ellen DeGeneres, will air on Sunday, March 2nd. Stay tuned as we update with more star reactions.